But are we pooing our money into the toilet? A very comprehensive health builder. 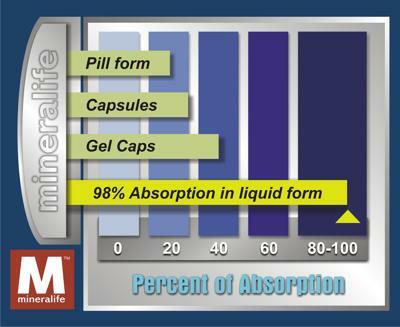 Best MultiVitamin and Minerals on the market. Ionic Liquid form, easily absorbed by the body. Suitable for people of any age. Good for children, the sick and older folks with difficulty swallowing. Mineralife Ionic Minerals are meticulously prepared from a pure (up to 99.99% pure) elemental source in the purest energy enhanced structured water (a multi- step purification and energizing process) called MET-Water? (Magnetic Enhancement Water). Mineralife, through a complex proprietary process, liquefies minerals to a state where if dehydrated will grow crystals yielding a highly bio-available form of mineral that is non-metallic and is in simple, angstrom sized ionic form. The ionic charge is opposite of the charge of the intestinal walls, which allows the minerals to be automatically drawn to the walls of the intestines, where, because of their minute size, they are readily absorbed at a near 100% absorption rate. Mineralife's process closely resembles the dynamic and intricate functions of nature. This produces a mineral nutrition delivery-system in line with nature's own design. until shipping cost is confirmed to you. please check payment options and shipping info. and the consequence of taking personal responsibility to provide and do what is beneficial for the body on a consistent daily basis. Only with a healthy body can we pursue our dreams and accomplish that which we are here to do.